Samuel F. B. Morse, American artist and inventor, designed and developed the first successful electromagnetic (magnetism caused by electricity) telegraph system. Samuel Finley Breese Morse was born in Charlestown, Massachusetts, on April 27, 1791. He was the first son of Jedidiah Morse, a clergyman, and Elizabeth Breese, of New Jersey. "Finley," as his parents called him, was the son quickest to change moods while his other two brothers, Sidney and Richard, were less temperamental. His brothers helped him out many times in his adult years. The Morses' commitment to education had Samuel in Phillips Academy by the age of seven. Though not a star student, his drawing skills were good. Both his teachers' and his parents' encouragement led to Samuel's success with miniature portraits on ivory. Samuel graduated from Yale College in 1810. He wished to pursue a career in art, but his father was opposed to this. Samuel took a job as a clerk in a Charlestown bookstore. During this time he continued to paint. His father reversed his decision and in 1811 allowed Morse to travel to England to pursue art. During this time, Morse worked at the Royal Academy with the respected American artist Benjamin West (1738–1820). In 1815 Morse returned to America and set up a studio in Boston, Massachusetts. He soon discovered that his large canvases attracted attention but not sales. In those days Americans looked to painters primarily for portraits, and Morse found that even these sales were difficult to get. He traveled extensively in search of work, finally settling in New York City in 1823. Perhaps his two best-known canvases are his portraits of the Marquis de Lafayette (1757–1834; a French general who served with George Washington [1732–1799] during the American Revolution), which he painted in Washington, D.C., in 1825. In 1826 Morse helped found, and became the first president of, the National Academy of Design, an organization that was intended to help secure sales for artists and to raise the taste of the public. The previous year Morse's wife had died; in 1826 his father died. The death of his mother in 1828 dealt another severe blow, and the following year Morse left for Europe to recover. I see no reason why intelligence might not be instantaneously transmitted by electricity to any distance." He immediately made some sketches of a device to accomplish this purpose. Even as an art professor at the University of the City of New York, the telegraph was never far from Morse's mind. He had long been interested in gadgetry and had even taken out a patent (document protecting the owner of an invention from having it stolen). He had also attended public lectures on electricity. His shipboard sketches of 1832 had clearly laid out the three major parts of the telegraph: a sender, which opened and closed an electric circuit; a receiver, which used an electromagnet to record the signal; and a code, which translated the signal into letters and numbers. By January 1836 he had a working model of the device that he showed to a friend, who advised him of recent developments in the field of electromagnetism—especially the work of the American physicist (scientist of matter and energy) Joseph Henry (1797–1878). As a result, Morse was able to greatly improve the efficiency of his device. In September 1837 Morse formed a partnership with Alfred Vail, who contributed both money and mechanical skill. They applied for a patent. The American patent remained in doubt until 1843, when Congress approved thirty thousand dollars to finance the building of an experimental telegraph line between the national capital and Baltimore, Maryland. It was over this line, on May 24, 1844, that Morse tapped out his famous message, "What hath God wrought [made]!" Morse was willing to sell all of his rights to the invention to the federal government for one hundred thousand dollars, but a combination of a lack of congressional interest and the presence of private greed frustrated the plan. Instead he turned his business affairs over to Amos Kendall. Morse then settled down to a life of wealth and fame. He was generous in his charitable gifts and was one of the founders of Vassar College in 1861. His last years were spoiled, however, by questions as to how much he had been helped by others, especially Joseph Henry. Morse died in New York City on April 2, 1872. Coe, Lewis. The Telegraph: A History of Morse's Invention and Its Predecessors in the United States. Jefferson, NC: McFarland, 1993. Mabee, Carleton. The American Leonardo: A Life of Samuel F. Morse. Rev. ed. Fleischmanns, NY: Purple Mountain Press, 2000. Tiner, John Hudson. Samuel F. B. Morse: Artist with a Message. Milford, MI: Mott Media, 1985.
i think your article is very good actualy samuel f.b. mores was my 3rd great grandfather. it is very cool. iS yOuR gReAt, gReAt, gReAt GrAnDfAtHeR rEalLy mR. mOrSe? Samuel Morse was actually married twice and had 8 kids. 4 with his first wife and 4 with his second. This biography skips his years in Paris (after England). He spent years in the Louvre painting a picture that would show Americans in America that there was a world of art that they did not see. He wanted Americans to be more interested in art like the French and most Europeans. I think Samuel Morse interesting. 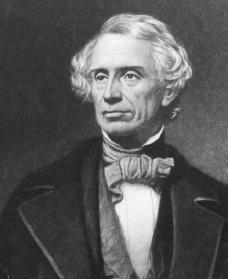 Samuel Morse is the person i,m doing for the wax museum i,m doing at school. if you don't know what a wax museum is it is mostly dressing up like the person you are doing and talking about who you are and some facts about your person.